Movies Like Gravity: Science Fiction Thrillers '+g+"
Gravity is a 2013 science fiction thriller about two astronauts Dr. Ryan Stone (Sandra Bullock) on her first space shuttle mission and veteran astronaut Matt Kowalsky (George Clooney) commanding his final expedition survive the mid-orbit destruction of a Space Shuttle and attempt to return to Earth. 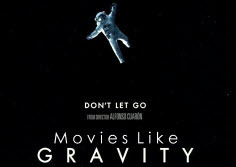 If you are a fan of science fiction thriller movies like Gravity then find the recommendations for it below and don't forget to mention if we miss any as we keep on updating this list. Marooned is a 1969 American film based on the novel Marooned by Martin Caidin. The story of Marooned revolves around three astronauts as the first crew of an experimental space station experiences main engine failure of their spacecraft on their return to earth are now stranded in orbit waiting to be rescued before their oxygen runs out. Apollo 13 is an adaptation of the book 'Lost Moon: The Perilous Voyage of Apollo 13' by astronaut Jim Lovell and Jeffrey Kluger. The story is about three astronauts aboard Apollo 13 for America's 3rd Moon landing mission has to abort it due to Technical troubles in the spacecraft that turned the exploration into a test for survival. Moontrap is a 1989 science fiction movie. Its the story of a group of astronauts who discover strange artifacts in a derelict spaceship returns it to earth. Unfortunately, those strange artifacts were part of a plan to invade the Earth. Apollo 18 is a 2011 American science fiction horror movie. It is a story of NASA's abandoned Apollo 18 mission, where two astronauts were sent on a secret expedition to the moon funded by the US Department of Defense and the real reason U.S. has never gone back to the moon. Love is a 2011 science fiction movie about an Astronaut who becomes stranded in space after loosing contact with earth. As time passes and life support systems dwindle, he battles to maintain his sanity and simply stay alive. Prometheus (2012),....if you can think of more, then don't forget to mention it in comments.